During our off-site preview session with Square Enix, we were fortunate enough to get the chance to sit down and talk to the one and only, Kim Swift. One of the mind’s behind the ever-popular Portal franchise, Kim Swift left Valve to work with Airtight Games. Cary: So how are you? Kim: I’m doing all right. Cary: Super. Would you say super? 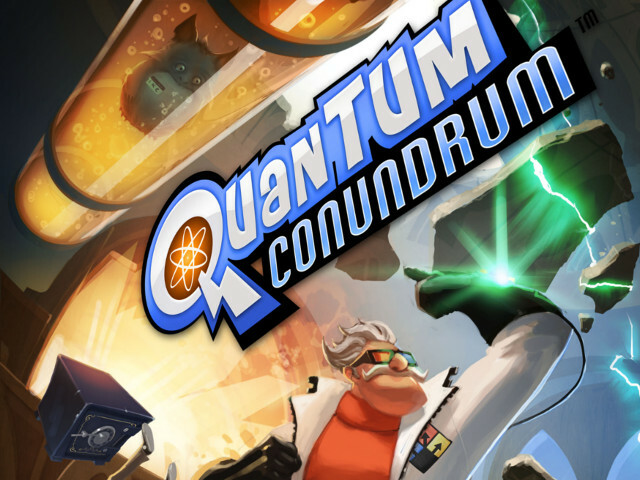 Cary: So Quantum Conundrum is going to be on XBLA, PSN, and Steam? Kim: Yes. Coming out this summer. Cary: Okay, now, when I hear XBLA, PSN, I assume $15 or $20, but there’s no announcement? Kim: I honestly do not know the price point and I don’t know the exact date. Cary: Okay, it’s just summer some time? Kim: Yeah, it is summer this year. I’ll know all of that stuff next week, but I have no idea. Cary: The trial that I played is super polished, so how long have you guys been working on the game? Kim: So we’ve been working on the game for, I don’t know, a little under a year or so? Full production. And this particular demo we actually took levels from our game and pieced them together in an order that we thought would be appealing to gamers, and wrote custom dialog for it as well. Cary: I gotcha, so the trial is completely different from what the campaign would be? Out of order? Kim: Yeah, it’s out of sequence. It’s definitely out of sequence. So it is like the first level of the game, the third level of the game, the sixth level of the game, and then I don’t even remember the place at this point, but it comes right in the middle of the game. Cary: Okay, so the machanics of the game. Is this something you’ve always wanted to… I don’t know if you can talk about other things you’ve worked on, or how you’d want to introduce that. Kim: I just kind of came up with the game all of a sudden, while I was taking a walk. There was nothing that inspired me and I was like, “Oh hey, that’d be good.” I pitched the game to my team and we had some other games that we were pitching amongst ourselves too, as well, and we voted on the game that would be the fastest for us to get up and running quickly. So that way we could test to see if it was fun or not. That way if this didn’t turn out to be fun, we could go on to the next game that was on the list. Cary: Now, the mechanics for switching the weight of objects and all of that other stuff also seems to affect the paintings. Cary: So why does that happen? Kim: It affects the entirety of the environment, so it’s not just the physicality of the objects. It’s a completely different dimension existing in the same space. Kim: So, you know, what the family members of Prof. Quadrangle look like in fluffy dimension are completely different from how they look like in normal. Cary: Does it also affect their attitude? Kim: Yeah! It’s just the way we were always thinking of it. Initially the paintings came out as a gag in our very first demo. We were like “Oh wow, this would be funny if we had all of the paintings switch in the different dimensions.” Because everything else is switching, why wouldn’t the art on the walls? Everyone loved it so much, so we were like, “Okay, so we need to put in a LOT of these.” And we also found that the paintings were a really good way to convey the story and background not only of Prof. Quadrangle, but his house, his family, his pets. So quite a few of the paintings as you walk through, especially in the hallways of the game, if you go to a painting and look at it, professor quadrangle will actually tell you a story about that painting and who that person was, and who that dog was that’s stretched all around the room, and stuff like that. We just wanted to be able to add as much story as possible in a way that we could actually afford to do it. Cary: The main item that seems to drop is a safe. Cary: Now obviously that’s a very heavy thing visually. It’s like a ten ton thing from acme labs or something, you know what I mean? Kim: Yeah. Well the safe came from being inspired by looney tunes. Cary: So there’s nothing in the safe? He just has safes? Kim: We have a running gag that there’s something in the safes, and every once in a while one will make a noise. (hehehe) Like there might be something inside? So maybe you’ll hear more about what’s in the safes in the future. Cary: It is obviously only a single player campaign, and there’s only ever one effect that can be applied at any given time. There’s never any kind of combo type of items? Kim: For the first game, we came up with so much content just by having those four dimensions, and we actually talked about the idea of having a couple of dimensions coexist at the same time, and it was one of those things that came down to like, “We have enough stuff. We’re good for now.” (hehe) Maybe later. You never know, but for now we’re pretty good. Cary: The game design elements. It almost, I want to say, it almost forces your perspective to find the solution to the puzzle. So you’ll push a button and all of the safes will come down and you’ll see a laser and go “Oh, I need to make steps out of those.” Is that a running theme, that you are almost kind of assisting the person all the way through? Or is it going to be kind of more abstract puzzle thinking? Kim: So one of our goals when we design puzzles for a game, we want players to, within a minute, know what they should be doing. Then it is a matter of executing what they think they should be doing. WE found that, just in general, it is a good way to alleviate player frustration. If a player comes in and is thrashing around and has no idea what they’re doing, they’re going to get frustrated, and they might throw down the controller and they might never come back. And so we wanted to give players that feeling of “I can see all of the elements that I need to put together, its just a matter of putting it together with my head.” We want players to see the solution pretty quickly. Cary: I gotcha, there’s a lot of, I want to say, repetition that encourages previously learned ideas. And when I played the demo it is like I only had to see something once, and then I had to quickly move on. But the level design kind of helps with that. The level design is almost that kind of cel-shaded, cartoonish look, almost. Now is that because of the 10 year old persona that you use? Because Dr. Quadrangle, unless he has this elaborate mansion with wooden beams and everything, is it because you’re looking through the eyes of a ten year old that it looks that way? Because the chairs are humungous, you know? They’re oversized. Is there any element that the games should look like it would look from a child’s perspective? Kim: Yeah, we definitely wanted objects to look bigger and look more intimidating. We wanted that overstuffed chair to look like something that was like, “Well yeah, a ten year old wouldn’t be able to move this big fat chair.” And also we played around with a bunch of different art styles, and it came down to this one, because we felt like it fit the gameplay. I mean, the fluffy dimension. Clearly it isn’t going to look super hot in a really realistic, gritty game. It’s gonna look a little weird, so you know we played around and settled on this one. And it was the principle of, a lot of our objects, you’ll notice they come thick to thin, and a lot of that comes from our references, looking at Dr. Seuss, and Tim Burton, and Pixar. Those are kind of our touch stones for our art style, and kind of coming back to that as far as figuring out what our proportions are and the general look and feel of the game. Cary: I gotcha. What I want to touch on is that, you can die. Cary: As a 10 year old, you can die. Kim: Yep. Oh yeah, you can die. Cary: And Dr. Quadrangle is your uncle. Cary: And he seems to be alright with that. Kim: (Hehehe) Yeah, I mean, so one of his character progressions is at first, as a person he’s relatively self-absorbed. He doesn’t quite realize that something that isn’t that dangerous for him might be dangerous for a 10 year-old kid. He’s in his own head. And so at first he’s definitely like, “Oh, what’s the problem with that?” And towards the end of the game he’s sort of like “Oh crap, oh, I’m sorry.” (hehe) So yeah, he’s got a character progression of his own throughout the game. Cary: Oh, nice. Alright, so that’s cool. Cary: I only died once. Cary: Now, Quantum Conundrum, it definitely feels like a certain game that we’ve all played and loved. Especially the narrator. This sort of omnipresent narrator. Cary: Is that something that you wanted to continue along the lines of? Because the narrator’s even in the same type of mindset, almost. Cary: I mean, a test subject type of thing. Kim: He’s not really trying to test you, so much as he wants you to do some stuff for him, and so that way you can get out of his house. He actually wants you to leave. And, you know, the character attitude is different. Overall he’s not a sinister guy. He’s not trying to hurt you. And as far as where, you know, “You’re having a narrator piping over a sound system…” It’s a matter of constraint. We’re a downloadable title. It’s not like we had a $10 million budget to throw around and do whatever we want. And so it came down to, you know, we wanted to be able to tell a story, and players to not feel alone, and have a character there, but we couldn’t afford to have a walking, talking character traveling along with him. And so this is the way to solve it. Cary: But you guys got Q! Cary: How was it to work with him? Kim: Oh, he’s a great guy. Cary: Are you working with him in the voice recording studio? Kim: We had two recording sessions with him, back around November, and then another one in January. Great guy to work with, super nice. Has great stories. His son is apparently a super badass guy that’s working with the military. But yeah, great guy. Does a lot of theater. Cary: The last question I’d like to ask is kind of stepping back into logic, even though it shouldn’t be entered into this conversation. Cary: It’s like, oh, you know, my crazy brother, he’s going to be the perfect one to drop him off to. Kim: He hasn’t killed him so far! (Hahaha) Well, the level of thinking was, “Well, my brother’s kind of weird, he’s probably pretty lonely. He could probably use some company for the weekend, and I could use a weekend off, so we’ll just pawn him off on this family member. Cary: Just ring the doorbell, (tire squeal). Cary: Okay, Kim, thank you for your time. I appreciate it.